Guam: Poltergeist? Amityville? NAVY HOUSING! In the battle of Orote Peninsula, from July 26 to 29, 1944, 3,372 Japanese soldiers were killed and hastily buried in mass graves by Seabees using bulldozers. This site, now located within the Lockwood Family Housing area, was a large bomb crater. According to local eyewitness, the Seabees used the crater to bury an unspecified number of Japanese soldiers. 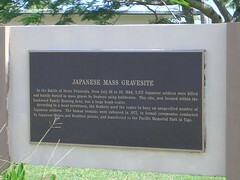 The human remains were exhumed in 1972, in formal ceremonies by Japanese Shinto and Buddhist Priests and transferred to the Pacific Memorial Park in Yigo. Admittedly, I get spooked easily ~ blame it on reading one too many “scary” novels in my youth, but I bet most people would be a bit uncomfortable with a ‘mass grave’ sign in their yard. 5) Jaws ~ I read this while living in Puerto Rico. Made me more than a little leery about what was lurking in the ocean. 4) The Shining ~ I read this one before I knew I would some day live in the Grand Teton National Park during the winter when the lodge I worked for was closed (it only opened during the summer). There were about thirty employees, some with families, on the winter staff so it wasn’t quite as isolated as The Shining but there was every bit of snow like the movie so it was close enough. 3) Pet Semetary ~ Just plain scared me. 2) Silence of the Lambs ~ You won’t see me walking close to one of those utility vans! 1) The Exorcist ~ To me, this is the only one where the movie and the novel were equally frightening. So far, Andersen AFB doesn’t have any spooky history that I’ve seen advertised but if you’re out walking or running, you feel as though you’ve walked onto the set of Alfred Hitchcock’s “The Birds”… more on that later.